On July 5, 2018, the new second generation ADT Pulse iHub was released on the market to replace the old one. We’ve installed device in many homes and businesses in the last year and it has proven to work very well. We’ve found that this device is a little easier to install and has fewer issues or firmware upgrades. Additionally, the ADT Pulse iHub is known to have a greater WiFi and Z-wave range than the original one. I do like that it stands up vertically compared to the horizontal old iHub. It’s also black, which looks cool, but I’m sure the smaller size and design also contribute to the sleeker look. I don’t know of any reason someone would want to buy this one to replace their old one, but some people do like to have the newer and nicer model. Contact us if you are this sort. 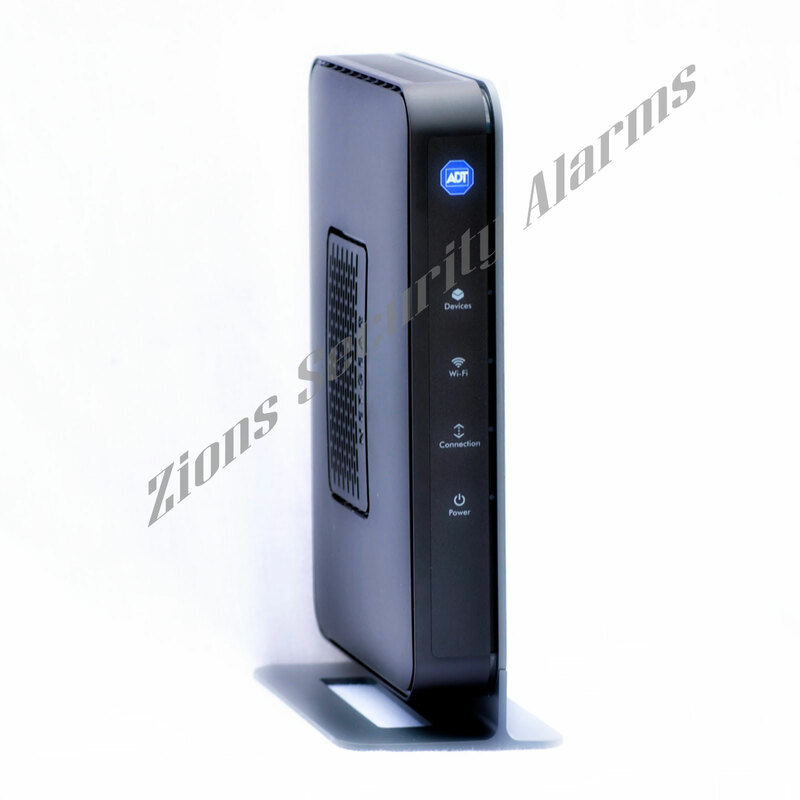 Zions Security Alarms is a Utah-based, ADT Authorized Dealer. They install ADT Monitored Security Systems in Utah and California. Popular cities where they install include Salt Lake City, Saint George, San Diego, Los Angeles, Riverside, Fresno and Sacramento. Please visit our website or contact us for questions. Can the iHub connect wirelessly to the Lynx Plus keypad? , which lets you use your existing AC electrical outlets to connect instead of a cat5 connection. I have this installed in my house. I noticed that the hub puts out a WiFi signal which none of the sensors use to connect to. How do I turn off the WiFi or atleast make it hidden. Here is the answer I got from iControl. The iHub/ngHub is a wifi access point and broadcasts its network name/SSID. It is used as a private subnet for the Pulse wifi devices only (wifi repeater, wifi cameras, and wifi touch screens). It is a closed, private network unusable by visitors to your home. No one can jump on this private network with their laptop or iPhone or connect their own wifi camera, … The encryption key is not known. Hos easy is to upgrade from the old ihub to this new model. I am in the MD area and would like to purchase one. I Think the process is an easy one but I have never done it myself. I recommend calling ADT to see if they could do it over the phone if you had a new one or if they would need to send a technician. I have not heard of anyone having success with this but please let us know if you are. I would suggest an IP camera system, those are usually the ones that can be connected remotely. Can the power line Nano adapter interfere with my router internet signal. It seems to slow my WiFi down. It is possible, I would remove it and see if the internet speed goes up and then put it back and see for sure. But keep in mind that the nano adapter does not use wifi it uses a wired ethernet connection. Is there a way to update the firmware on the device or does ADT do this automatically? I have a nighthawk 6000 as my primary house router and using Netgear genie I can upgrade firmware and reset the device to clear the cache if need be. ADT installed one of these in a clients home. We had a stable robust wifi installation until the hub went online. The client uses the Pulse only for remote access to existing legacy system. There are no Pulse cameras (we installed and service a surveillance system) and no Pulse wi-fi enabled touchscreen interface. Really need to turn the WiFi off. It is by far the highest amplitude wifi signal on ground level of home. Existing access points are on CHs 1, 6 and 11. Pulse is on 11. Any other Netgear wifi enabled router it is simple to turn off the wifi.. What is the ip address of the user interface? Anyone? Other option is to” bury” this in the far corner of the basement. Unfortunately ADT has not provided a way to change anything on the gateway. But maybe the best thing to do would be to install it in a location where you can put a faraday cage around it to reduce its interference.